We’ve all heard the forecast relating to IoT, and the prediction of 38 billion devices to be installed by 2020. The IoT IS often considered from a consumer standpoint - think smart thermostats and fridges. However, the Industrial IoT (IIoT) market will play a greater role in improving public safety and efficiency. Here, Nick Hawkins EMEA Managing Director, Everbridge, explains further. The utilities industry has long used sensors in reservoirs to monitor water levels and predict when more supply is needed. A recent survey by 451 Research stated that 71% of global businesses are now gathering IoT data and 90% expect to increase investment in connected technologies in the next 12 months. IoT can automate communications and pre-empt a crisis before it causes serious damage. Critical communications platforms are already deployed by businesses, local authorities and national governments around the world to warn and advise people in the event of a crisis. These incidents can range from sourcing a relevantly skilled IT technician to repair a broken server, to engaging with the public during a terror threat. 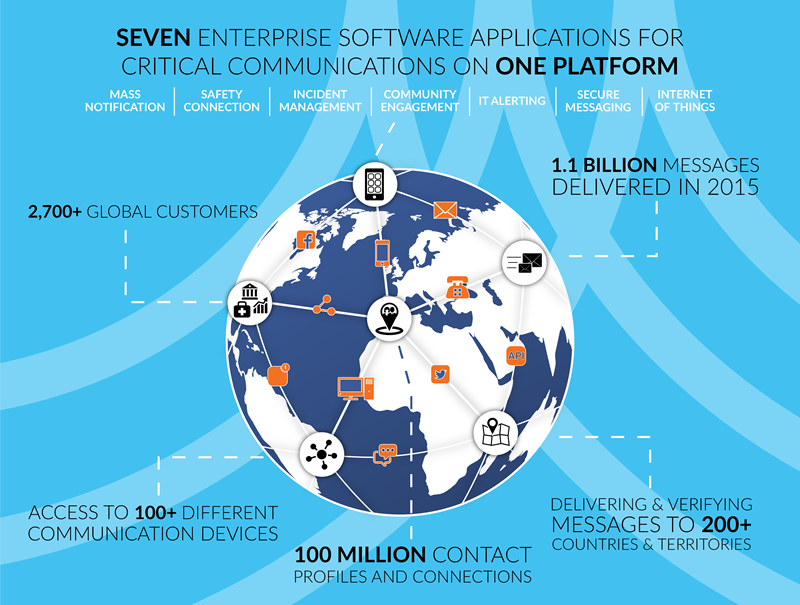 Central to the success of critical communications platforms are two key functions. The first is the capability to deliver messages using a variety of different methods - this is known as multi-modal communications. No communications channel can ever be 100% reliable 100% of the time, so multi-modality transforms the speed at which people receive the message. Multi-modality facilitates communication via multiple communication devices and contact paths including email, SMS, VoIP calls, social media alerts and mobile app notifications, amongst many others. Multi-modality ensures that it is easier to receive a message. Two-way communication makes it simpler to confirm a response. In a critical emergency every second counts, so organisations can use communications platforms to create and deliver bespoke templates that require a simple push of a button to respond to. In doing so, the level of response to critical notifications can increase significantly. For instance, if a business that knows 30 of its employees are in a city when a riot breaks out, it can send a notification to all staff in the vicinity warning them of the danger. The message will have the option to reply with “I am OK” or “I need help” with a single press of a button, allowing organisations to build a clear picture of an incident within minutes and have a detailed understanding of where best to deploy resources. Combined, multi-modality and two-way communications transform critical communications from an incident alerting platform into a communications tool where organisations can respond smarter and faster. In situations where multi-modal communications and response templates are deployed together, response rates to messages increase from around 20% of recipients to more than 90%. Where does the IoT fit in? Combining data from IoT devices with a critical communications platform offers a new emergency alerting platform for automated decision making and sophisticated communications. This provides businesses with the ability to add context to critical alerts, connecting the right people to physical devices, at the right time, to take the appropriate action. IoT also enables physical devices to respond to situations and act accordingly. By integrating critical communications with IoT, organisations can improve business continuity, minimising the impact of crises including incidents such as security breaches, warehouse fires or malfunctions on the assembly line. The most effective way to take action during a critical event is often not people communicating with other people. An increasing number of devices connected to the internet rely on embedded intelligence to communicate critical information. These devices not only provide constant monitoring services, but have the ability to apply real time control as needed. In many cases, these automated, intelligent devices can respond faster than a human - an example is an automatic breaking system, which will pump the brake faster than alerting the driver. Devices with embedded intelligence can interpret data to confirm if communication is necessary. The flexibility that critical communications IoT applications offer means that no matter what the crisis, employees, members of the public and an organisation’s infrastructure can be protected. Virtually any IoT device can be integrated with a critical communication platform to improve its self-regulation and ability to communicate. Today there are devices monitoring critical aspects of all different kinds of systems - from power grids, data centres and factories to smart buildings and medical devices. Imagine a world where your appliances and business applications could self-diagnose. Automated device-to-device communication is powerful, however, the need for human interaction does not disappear. For crises that require the involvement of engineers or emergency services, IoT can speed up the delivery of critical information and ensure a timely response. For example, if an airport runway bulb is broken, IoT critical communications technology could alert the nearest available engineer - limiting down-time and ensuring daily running is unaffected. A state government operated dam may have sensors placed inside the stone and metal walls to automatically alert engineers and local authorities if water levels rise too high, tailoring the communications based on severity level and the roles and responsibilities of appropriate workers. In the medical industry pacemakers can be fitted with sensors that relay information to a team of doctors and notify them via email, text and/or phone if anything requiring their attention arises. They can also send messages to the patient to let them know if they are exerting too much energy and should rest. This protects the individual and also manages the increasing pressure on A&E departments. By pre-empting severe changes in heart palpitations, the patient can be treated before their condition worsens and they need to visit the hospital. In retail, internet enabled RFID tags attached to clothing allow the items to be tracked throughout the supply chain. This enables store managers to know exactly how many dresses of particular styles/sizes are in stock, how many are on their way from suppliers, and when to expect delivery. A non-critical incident for one business may significantly impact revenues for another. For multi-national organisations, the loss of IT functionality caused by a faulty server will result in a loss of efficiency. For an e-commerce company, where revenue relies on constant up-time, each hour the server is down severely impacts revenue. The crisis may be the same, but the impact is vastly different. No organisation can effectively prepare for every eventuality, so the ability to quickly and effectively communicate with key stakeholders in any circumstance is essential in effective crisis responses.